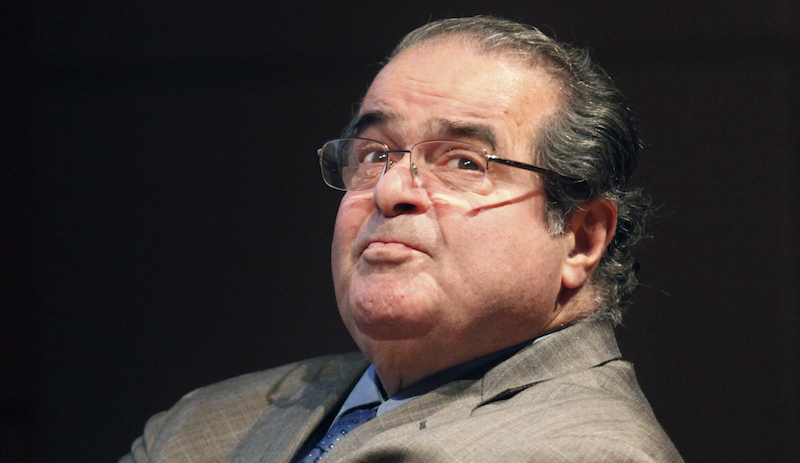 Supreme Court Justice Antonin Scalia, who unexpectedly died at the age of 79 today, will be remembered as one of the most polarizing figures in American government, famous, or perhaps infamous, for his strong conservative stances on abortion, campaign finance, the death penalty and gay marriage. On June 27, 2011, he also delivered an opinion worthy of appreciation from those who love video games. Scalia wrote on behalf of the majority, in a 7-2 ruling against the state of California’s attempt to criminalize the sale of violent video games to minors. California was attempting to treat violent games like cigarettes and alcohol, arguing that violent video games, unlike other forms of violent entertainment, could cause changes in children’s minds and actions. Scalia and six other justices would have none of it and instead affirmed that video games, like movies, books, music and all other artforms are speech and are protected by the First Amendment to the Constitution of the United States. Video games qualify for First Amendment protection. Like protected books, plays, and movies, they communicate ideas through familiar literary devices and features distinctive to the medium. And “the basic principles of freedom of speech . . . do not vary” with a new and different communication medium. Joseph Burstyn, Inc. v. Wilson, 343 U. S. 495, 503. California’s argument would fare better if there were a longstanding tradition in this country of specially restricting children’s access to depictions of violence, but there is none. Certainly the books we give children to read—or read to them when they are younger—contain no shortage of gore. Grimm’s Fairy Tales, for example, are grim indeed. As her just deserts for trying to poison Snow White, the wicked queen is made to dance in red hot slippers “till she fell dead on the floor, a sad example of envy and jealousy.” Cinderella’s evil stepsisters have their eyes pecked out by doves. And Hansel and Gretel (children!) kill their captor by baking her in an oven. California’s argument would fare better if there were a longstanding tradition in this country of specially restricting children’s access to depictions of violence, but there is none. The State’s evidence is not compelling. California relies primarily on the research of Dr. Craig Anderson and a few other research psychologists whose studies purport to show a connection between exposure to violent video games and harmful effects on children. These studies have been rejected by every court to consider them, and with good reason: They do not prove that violent video games cause minors to act aggressively (which would at least be a beginning). Instead, “[n]early all of the research is based on correlation, not evidence of causation, and most of the studies suffer from significant, admitted flaws in methodology.” They show at best some correlation between exposure to violent entertainment and minuscule real-world effects, such as children’s feeling more aggressive or making louder noises in the few minutes after playing a violent game than after playing a nonviolent game. Of course, California has (wisely) declined to restrict Saturday morning cartoons, the sale of games rated for young children, or the distribution of pictures of guns. The consequence is that its regulation is wildly underinclusive when judged against its asserted justification, which in our view is alone enough to defeat it. Of course, California has (wisely) declined to restrict Saturday morning cartoons, the sale of games rated for young children, or the distribution of pictures of guns. California’s effort to regulate violent video games is the latest episode in a long series of failed attempts to censor violent entertainment for minors. ... We have no business passing judgment on the view of the California Legislature that violent video games (or, for that matter, any other forms of speech) corrupt the young or harm their moral development. Our task is only to say whether or not such works constitute a “well-defined and narrowly limited clas[s] of speech, the prevention and punishment of which have never been thought to raise any Constitutional problem,” (the answer plainly is no); and if not, whether the regulation of such works is justified by that high degree of necessity we have described as a compelling state interest (it is not). Even where the protection of children is the object, the constitutional limits on governmental action apply. Brown vs. Entertainment Merchants Assn.